When I was a little kid, the list of foods I found downright revolting was long: bananas, apricots, squash, peas, lima beans, kidney beans, mustard, green olives, hard-boiled eggs, chili, cooked carrots, sweet pickles, hash of any kind, salmon, chicken on the bone (except for Gramma Rhetta’s legendary fried chicken), meat loaf, any casserole containing hot tuna fish, the dreaded Shipwreck Casserole, and anything containing mushrooms. To name a few. Some of those aversions have stayed into adulthood, but luckily, as a card-carrying grown up, I don’t have to endure Shipwreck Casserole or cooked carrots any more because the one doing the cooking/food purchasing/meal planning is good old moi. Some food aversions I just grew out of, and while they’re still not my favorite thing on the planet (apricots, I’m talking to you), the sight of them no longer makes the hair stand up on the back of my neck. Some of my former enemies I absolutely grew to love, like mustard, salmon and mushrooms. To be fair, we never really ate salmon at home and the only mushrooms I encountered were of the canned variety, so I didn’t really know what I was missing. Fresh mushrooms are altogether different from their tinned brethren, thank goodness. I’ve been relying so heavily on fresh mushrooms (of all varieties) during these past few weeks of quasi-vegetarian eating that I’m ready to declare myself The Goddess of All Mushroomy Things. I am waiting for my crown and my laminated certificate. We laughed, but honestly, I had no idea. I Googled it because I’m weird like that and viola! We are in the clear. We are unlikely to be scarfing down 5 pounds of morel mushrooms at a time, so we can rest easy. Mushrooms are a natural thing to turn to when you’re trying to eliminate your reliance on furred and feathered creatures because they taste…meaty. And their texture is substantial and…meaty. It’s almost uncanny how meaty something totally un-meaty can taste. Mushrooms, you have saved our butts the last few weeks, so I thank you. The recipe I’m sharing today is just the ticket if you want something comforting and hearty (and vegetarian). The mushrooms are braised in beer, almost like you’d do with beef for stew, although they cook in a fraction of the time. Paired with a generous shmear of garlic, some caramelized onions and fresh rosemary, you’ve got something special. You can serve the mushrooms as is, over something like noodles, mashed potatoes or polenta–anything that will soak up that yummy, beer-spiked sauce. Alternatively, you can do what we did and slice the mushrooms, plop them on a crusty ciabatta roll, top with the braised onions and melt some gooey, buttery fontina cheese over the whole shebang. It makes for a spectacular sandwich. Really. You can even serve it for the football crowd. Speaking of football, I’ll be taking a bit of a hiatus this week, because my husband and I are hopping on a plane with Daddy-o to Pennsylvania. We’ll prowl around Pittsburgh for a few days and then drive down to Happy Valley, where we will hopefully witness my husband’s beloved Nittany Lions beat the tar out of Michigan. Go Penn State! This will really be a special week for us. We’re celebrating the birthdays of two of the best, most steadfast and genuine men I’ve ever known. I feel very lucky to be able to do that. Daddy’s always wanted to see a game in State College, and my husband hasn’t been back in decades. I’m anxious to see where he spent his college years and visit his old haunts. Plus, my father cannot stand Michigan, so there’s going to be a lot of hootin’ and hollerin’ going on. I love some good hootin’ and hollerin’. Not sure how strict we’re going to follow our vegetable-centered eating plan in Pennsylvania; we’ll be at the mercy of restaurants and brewpubs, so we might play a little wild and loose this week. Wish us luck, and I’ll have some fun things to tell you when I get back! Brush the mushrooms with a slightly damp towel to remove any dirt. Remove stems. Use a small spoon to gently scrape away the gills from the mushroom caps. 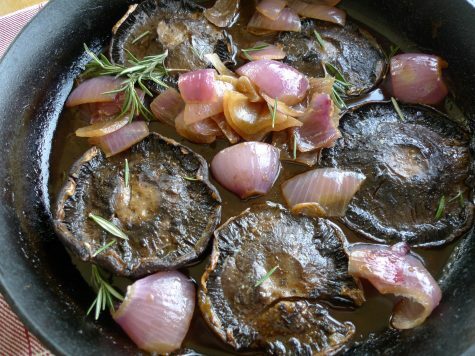 Lay the mushrooms and the onions in a roasting pan or in a 12-inch cast iron skillet, gill side up. Drizzle with the oil, using your hands to coat the mushrooms/onions evenly. 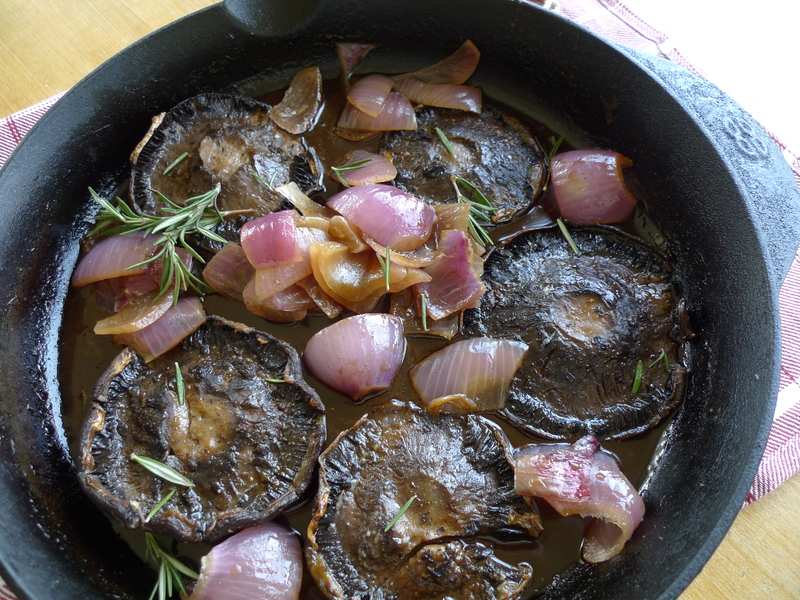 Season with salt and pepper, then scatter the garlic and the rosemary around the mushrooms. Pour about 3/4 of the beer and the tamari around the mushrooms (reserve the rest for de-glazing). Roast on the middle rack for 10 minutes or until the mushrooms are starting to collapse. Using tongs, gently flip the mushrooms over and push them around a bit to coat the gill sides in the roasting liquid. Flip the mushrooms back to gill-side up. Put back in the oven and roast for 10 more minutes until caramelized and the juices are reduced to about 1/2- 1/4 cup. Taste and season with more salt and pepper if needed. Remove the skillet or pan from the oven and arrange the mushrooms and garlic on a serving platter. 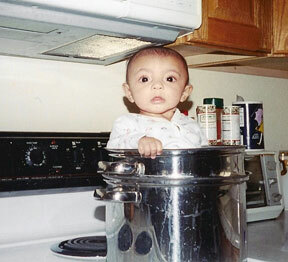 Set skillet or roasting pan on the stove burners over medium-high heat. Pour in the remaining beer and use a wooden spoon to scrape up any bits sticking to the bottom of the pan. Once liquid has reduced a little, drizzle the liquid over the mushrooms. Serve mushrooms with something to soak up the sauce, like mashed potatoes, rice or soft polenta. Alternatively, you can slice the mushrooms and serve them on crusty sandwich rolls. The moment you mentioned a childhood aversion to mushrooms, I knew you were talking about the canned variety as I hated them too! I still can’t eat cooked cabbage, but I can at least eat it raw in slaw (just vinegar and olive oil, thank you). I hope you have a great time in PA! Both of those recipes look like winners! I’m going to make them both! Since we are not doing Thanksgiving this year (my husband works all weekend and Daddy-o will be in Hawaii), I might do the mushrooms with creamy polenta for T-day! How fun is that? This is going on my must make list. Portobello mushrooms are one of my favorite foods and these look divine. Hope your trip is a special one! !